Each puzzle consists of a blank grid with clues on the left of every row and on the top of every column. 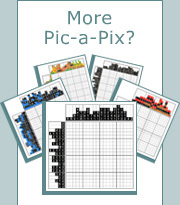 The object is to reveal a hidden picture by painting blocks in each row and column so their length and sequence corresponds to the clues, and there is at least one empty square between adjacent blocks. Each puzzle consists of a blank grid with B&W or colored clues on the left of every row and on the top of every column. The object is to reveal a hidden picture by painting blocks in each row and column so their length, color and sequence corresponds to the clues, and there is at least one empty square between adjacent same-color blocks. In the case of color puzzles, it is allowed to have no empty square between adjacent different-color blocks.